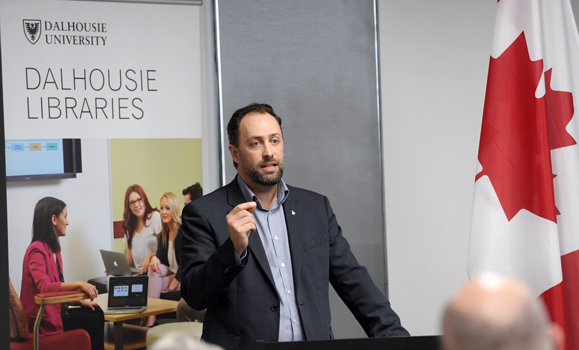 Indigenous culture, music and language was at the centre of an important event to launch Dalhousie’s partnership with the National Centre for Truth & Reconciliation (NCTR) on Tuesday, February 5. As the first East Coast hub of the NCTR, the space, located in the Indigenous Community Room of the MacRae Library on the Agricultural Campus in Truro, will encourage education and awareness about Indigenous history and will serve as a constant reminder to students, faculty and staff of the university’s commitment to reconciliation. Donna-Bourne Tyson, university librarian (right) speaks at the event alongside Elaine MacInnis, head of the MacRae Library. In addition to archival and research expertise, the Dalhousie Libraries have recently hired an Indigenous services librarian, Morning Star Padilla, who will facilitate connections between the local centre and the surrounding communities. The NCTR opened in 2015 at the University of Manitoba — a result of the 2007 Indian Residential Schools Settlement Agreement — to be the permanent home for all statements, documents and other materials gathered by the TRC. The NCTR was created to preserve the memory of Canada’s Residential School system and legacy. 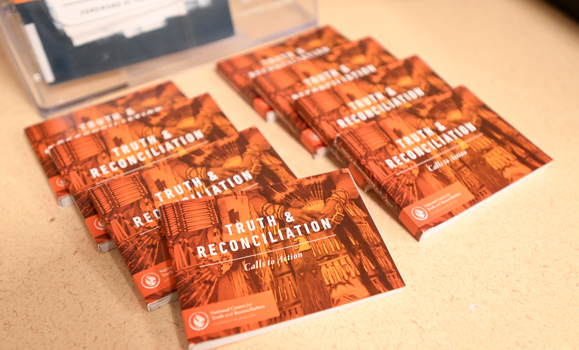 Moran facilitated the gathering of nearly 7,000 video and audio-recorded statements of former Residential School students and others affected by the Residential School system. He was also responsible for gathering the documentary history of the Residential School system from more than 20 government departments and nearly 100 church archives ­— millions of records in all. 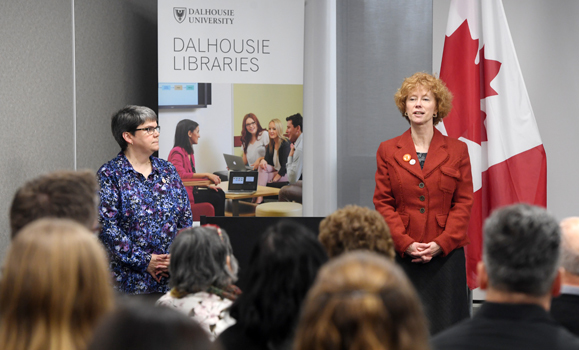 Through this partnership Dalhousie Libraries will ensure the NCTR’s archives are more accessible and better used in the Atlantic region. In the future, Dalhousie will grow the service to include contributing additional holdings to the NCTR; facilitating additional oral history and community narratives, research and reports; supporting a broad scope of public education, research, cultural and reconciliation activities; assisting the NCTR in serving the public in a variety of Indigenous languages, English and French and fulfilling regional or community needs and desires related to residential school research, education and reconciliation. 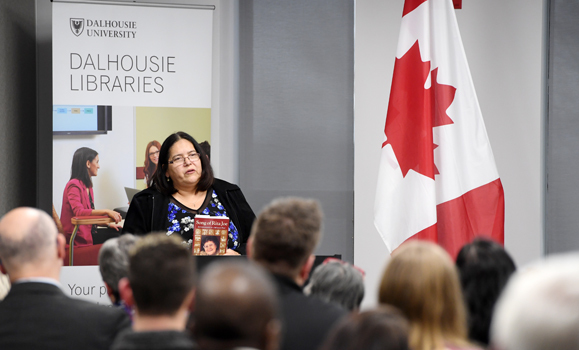 Highlights of the event included a welcome song performed by Catherine Martin, a member of the Millbrook First Nation and an independent, international award-winning film producer and director; and a recitation of Rita Joe’s poem “I lost my talk,” read by her daughter Francis Sylliboy. Joe was a residential school survivor and Mi'kmaw poet and songwriter. She was awarded the Order of Canada, and appointed to the Queen’s Privy Council. “I lost my talk” is also mounted on the wall in the Indigenous Community Room. Elder Jane Abram, one of the Elders in Residence at Dalhousie and a member of the Millbrook First Nation performed a smudging ceremony for guests in attendance Elder Jane is also a residential school survivor. Other speakers at the event including DSU President Aaron Prosper and Kji-Keptin of the Mi’kmaq Grand Council Antlé Denny, both from Eskasoni First Nation. The Grand Council is the traditional government of the Mi’kmaq nation. The Kji-Keptin is the political leader of the Grand Council.